HUNDREDS of identical investments with his wife's investments. Who does FLORIDA Governor RICHArD LYNN SCOTT think he's fooled? This creepy Medicaid fraudster invoked the Fifth Amendment privilege against incrimination 75 times in his deposition and his former company (COLUMBIA HCA) paid $1.6 to settle Medicaid/Medicare fraud. * "A blind trust with 20/20 vision" was one of the winning lines of the 1976 James R. Sasser campaign for United States Senator from Tennessee, used against Senator William E. Brock, III, a/k/a "the candy man from Lookout Mountain," subject of "I paid more taxes than Bill Brock" bumper stickers. TALLAHASSEE — Gov. Rick Scott’s blind trust, set up by the multi-millionaire to avoid perceived conflicts of interest, includes tens of millions of dollars in investments in the exact same companies as his wife, Ann. The holdings give the appearance of what one ethics attorney calls a “common investment strategy” that could undercut the intended independence of Scott’s trust, a POLITICO analysis of financial disclosure reports filed as part of Scott’s Senate campaign shows. Both the first lady’s investments and Scott’s blind trust holdings were revealed as part of federal financial disclosure forms filed in July. The overlap in their investments has not been previously reported. It’s clear from reviewing the holdings that actions Scott has taken during his nearly eight years as governor have affected companies in which Ann Scott holds an interest — which he could review as governor — and those held in the blind trust, in which a number of investments mirror those held by his wife. Scott, a Republican, says any potential overlap between administration policy and his investments is coincidental. But the situation raises additional questions about the intended firewall Scott said he set up to shield his official actions from any personal financial gain. Scott campaign spokesman Chris Hartline said Scott does not talk with Ann about her investments. Blind trusts are used by wealthy candidates and elected officials across the country. In Florida, both Democrats and Republicans have used them. Recent examples include former Florida CFO Alex Sink, a Democrat, and former Republican Gov. Jeb Bush. Blind trusts are designed to prevent potential conflicts of interest by blocking an officeholder from seeing specific transactions or investments held in the trust. What’s different for Scott, though, is up to $200 million in family investments are in the name of Ann Scott and were not put in the trust. Those investments could be viewed while Scott was making decisions as governor and were not required to be disclosed because Florida does not require elected officials to disclose investments held by spouses or other family members. The new federal disclosure forms, filed as part of Scott’s Senate race, also show a pattern of Scott and his wife both investing hundreds of millions of dollars in the same companies, raising questions about how shielded Scott was from the contents of the trust. When asked about potential conflicts between his administration’s actions and his personal investments throughout his time in office, Scott pointed to the blind trust and said that any intersection between official action and his personal investments is coincidental because he can’t see what’s in the blind trust. “I put all my assets in a blind trust, so I don’t know how they invested the dollars,” Scott said in July, offering a variation of the answer he often gives when asked about investments being impacted by his official actions. His comments came after a July court hearing in a lawsuit challenging the legality of Scott’s blind trust. The ongoing legal challenge was brought by Don Hinkle, an attorney and Democratic fundraiser. But the mirrored investments are another in a line of circumstances that raise questions about the blind trust’s independence. Ann Scott gave a six-figure personal loan to a woman who works at Hollow Brook Wealth Management, the New York-based firm overseeing Scott’s blind trust. That woman, a longtime friend of Ann, previously worked for Richard L. Scott Investments, LLC, the governor’s Naples-based investment firm. And most notably, the trustee of the blind trust is Alan Bazaar, a former Scott business partner who also previously worked at Richard L. Scott Investments. The larger picture of the Scott family’s combined wealth came into view when he filed federal financial disclosure forms as part of his U.S. Senate run against Democratic incumbent Bill Nelson. Federal election law requires investments held by family members to be reported. The federal disclosure forms for the first time showed the up to $200 million in family investments in Ann’s name, and showed the extent to which Rick Scott was not reporting his family’s overall net worth as governor. As required, Scott only reported investments in his name to Florida. This year, his holdings amounted to $233 million, of which $215 million was the blind trust. The federal disclosure forms show that Scott and his wife are worth between $248 million and $480 million. The higher figure, however, could potentially be much higher than that, since the federal disclosure form only requires reporting of the first $1 million of each investment “over $1 million and held independently by spouse or dependent child.” For example, if a stock holding was worth $3 million and held in Ann’s name, Scott would only have to report $1 million of that on his disclosure form. In general, federal disclosure forms require reporting just a range of an asset’s value, not exact numbers. Of the Scotts’ total, assets in Ann’s name — which did not need to be disclosed while Scott was governor and are not in the blind trust — total between $170 million and $206 million, but could be much more because she does not have to list the value of assets above $1 million. Hundreds of investments are held simultaneously in both Scott’s blind trust and by Ann Scott.Of the 426 unique assets, Scott and his wife have 175, or 41 percent of the total, in common. Those include things like investment funds, corporate securities, public debt, bank deposits, and mutual funds. Investment holdings held by both Ann and the blind trust include pharmaceutical company Gilead Sciences, global investment bank Goldman Sachs and Williams Companies, a natural gas pipeline company. Those 175 assets were worth at least $66.5 million for Scott and brought him an income in the last two-and-a-half years of at least $11 million; they were worth of at least $95.5 million for his wife and brought her an income in the last two-and-a-half-years of at least $18.7 million, according to the POLITICO analysis. 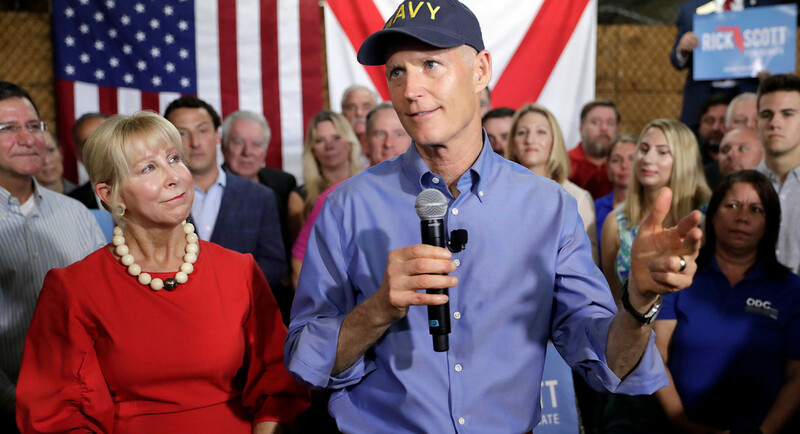 There are numerous examples of official Scott administration actions that benefit more than just Ann Scott’s investments, which Rick Scott could see while in office. — In 2017, a federal judge ruled the Scott administration was not properly caring for prison inmates with hepatitis C. That ruling prompted lawmakers to spend $21.7 million on Gilead Sciences drugs, a spending proposal signed off on by Scott. Ann Scott has an investment of between $50,000 and $100,000 in Gilead and claimed income from dividends and capital gains of between $150,000 and $1.1 million from the company last year. Scott’s investment in the company is between $15,000 and $50,000, and he reported dividends and capital gains income between $100,000 and $1 million. — Last year, Scott met with Goldman Sachs executives to discuss his proposal to block Florida from doing business with the companies that do business with Venezuela. Goldman had purchased $2.8 billion in bonds issued by the Venezuela state-owned oil company and were concerned Scott’s plan would box them out of state business. At the time, Goldman oversaw a nearly $500 million slice of Florida’s long-duration investment portfolio. Scott eventually approved a scaled-back version of his plan that did not cut off Goldman, a company with which Ann has investments of between $50,000 and $100,000, and from which she earned income of at least $60,000 in the last two and a half years. Scott’s blind trust had between $15,000 and $50,000 invested with the company, from which he earned income of at least $30,000. — In 2012, Scott signed off on the creation of Florida Polytechnic, the state’s newest university. Tulsa, Okla.-based Williams Companies donated land for the university and was also trying to sell land to developers who wanted to build around the new school. Scott’s blind trust has between $50,000 and $100,000 invested in the company, while Ann Scott has between $100,000 and $250,000 in it. With the exception of a brief time during his 2014 re-election campaign, Scott’s blind trust investments have not been visible to the public, which makes it unclear if the investments in the trust and those held by Ann Scott were purchased at the same time, or within the same time frame. Hartline, the Scott campaign spokesman, says the issue is moot. “Governor Scott has never made a single decision as governor with any thought or consideration of his personal finances,” he said.